Equi-Heart Pledge: How to Tune into the Wisdom of Horse? The Equi-Heart Pledge is all about tuning into the Wisdom of Horse. But how exactly do you do that? 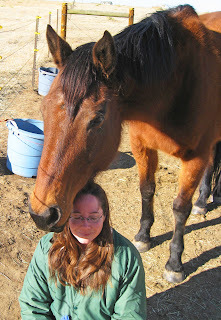 Serendipity, the lead mare of my Healing Herd, shared the secret with me last summer. In a quiet moment standing together, she said, "Come to me in the space of Pregnant Possibility. When you still your mind and open your heart, Horse can fill you with whatever is needed in the moment." "In fact", she continued, "you really ought to come to me in the space of Pregnant Possibility more often!" Then, in her no-nonsense way, she ambled off to pick a blade of grass, leaving me to finish cleaning the paddock. As I went to dump the wheelbarrow far across our 25 acre pasture, one of my favorite meditation spots called out to me, so I sat down to rest for a few minutes. Closing my eyes, Serendipity continued her dialogue, "Humans have a hard time quieting their minds and opening their hearts, and yet that's the space where we can join and wisdom & healing can enter." As I agreed with her, in my mind's eye, she showed me the details of a guided exercise that people can use to help them enter the space of Pregnant Possibility- where all inner knowing becomes available. It had to do with dropping down from the head (where many of us spend most of our time) into our hearts, and then allowing our hearts to lead us into a Sacred Space where Horse, and indeed, our Higher Selves could meet with us, to offer whatever might be needed to move ahead. I thanked her for showing me this exercise and promised to share it with people who wanted to partner with horse! So as you get ready to take your Equi-Heart Pledge, know that tuning into the Wisdom of Horse once a day is as simple as quieting your mind and opening your heart. It doesn't have to take any special tools or techniques. It can be as easy as taking 5 minutes with a horse, or in your imagination. Breathe deeply and allow all thoughts to empty from your awareness. Then breathe into your heart and send your love to Horse. Create a Circle of Love with your breath. As you breathe out, send your love to horse. As you breathe in, breathe in the love horse is sending you. Continue for a few breaths. From that place of a still mind and open heart, you've entered the realm of Pregnant Possibility. So ask Horse a specific question or ask what they would like you to know today. See what they wish to share. Then just notice the first thought, picture, or feeling that comes to mind. Trust that whatever has come to you, has come from Horse. You might enter a dialogue then, or sit with what has come and allow it to blossom. You'll find your unique way of connecting with the Wisdom of Horse. And it does get easier with time & practice! BTW- you might be surprised who shows up in your Sacred Space to offer this guidance! It could be the horse you are standing with, one who has passed over, or it might be the Spirit Horse Collective. Or, you may even have a mystical horse guide or two waiting to chime in! Don't be surprised if a Unicorn or Pegasus, even a baby Pegasus, makes an appearance...or a whole herd! If you need any support, I kept my promise to Serendipity and recorded the Guided Meditation she shared with me that day in the pasture! In the beginning of accessing your Wisdom Within, sometimes it is easier to be guided. With this 15 minute guided experience, you'll discover how to still your mind and open your heart to access that sacred space of Pregnant Possibility, where the Wisdom of Horse and your Wisdom Within will flow clearly. Once you know the steps, you can guide yourself in under 5 minutes! It's priced at only $3.33, so everyone who'd like a tool can have one to jump-start and deepen their communication with Horse! Visit the Wisdom Horse Meditation to grab your copy. There are as many ways to hear Horse as there are people! What's your easiest way to tune into the Wisdom of Horse? Please comment and share yours. Onward and upward with the Wisdom of Horse!